Angular jaws made from carbon tool steel & carefully heat treated which have a 30 degree offset to keep work in sight & clear of surface while cutting. For flush cuts on soft & medium materials. MCC BOLT CUTTERS Long Manufacturing History and High Quality Standard - Since 1928, when we began manufacturing Bolt Cutters in Japan, MCC has been leading the industry quality standards with its non-stop product improvements based on field in-depth research, multipurpose testing, and customer feedback. MCC implements quality control regulations ranging from the selection of raw materials to product packaging to maintain the consistence in quality that our products are known for and have attributed our popularity in the market. MCC highest record in market shares in Japan reached 75% in the 90's, a feat that is attributed not only to the strong distribution that was implied, but also to the consistence in quality materials being manufactured as a major playing factor increasing popularity in the market. The MCC high quality standard is also well known in the international market such as North America, Europe, Middle East and Asia as we have been exporting our products since the early 70's. 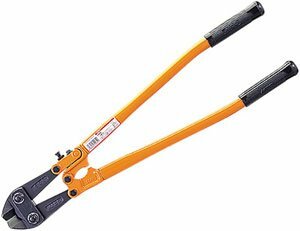 Currently, MCC Bolt Cutters are not only acquired by end users, but are also procured by many government agencies. MCC Bolt Cutters continue to be distributed widely through out the world. 30 degree offset to keep work in sight & clear of surface while cutting. For flush cuts on soft & medium materials. If you have any questions about this product by MCC, contact us by completing and submitting the form below. If you are looking for a specif part number, please include it with your message.